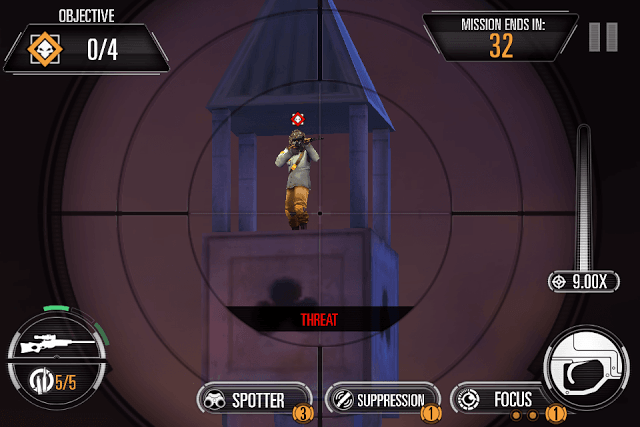 Sniper X with Jason Statham is an intense fixed-screen shooter that brings a celebrity twist to the typical mobile sniper fare. 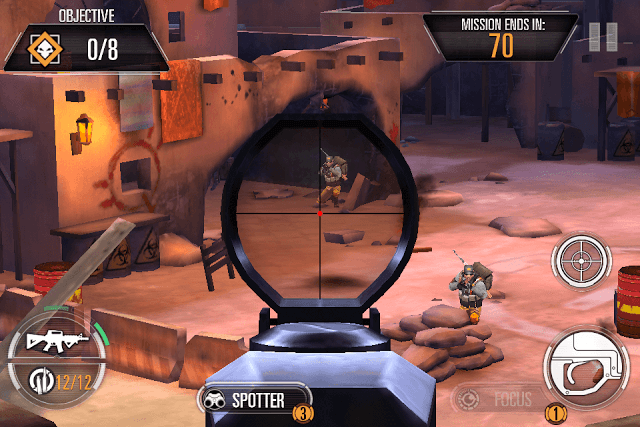 There are several other such games such as Sniper Strike: Special Ops but this game features the voice of The Transporter’s actor. Enemy snipers are alerted by the sound of gunshots. You may use suppression to silently take down one of the key enemies and then slowly put down snipers one by one. If you don’t have the suppression option available, then it would be wiser to take down all snipers first before targeting other enemies. Your scope automatically moves to the alert sniper when he is aiming at you. Be quick and snipe him down before he does. (Don’t go for a head shot. Aim for his body). Training mode is the best way to earn extra cash. If you are short of money and are planning to purchase an assault rifle, then head straight to the Train and Earn cash game mode. But make sure you have enough energy. You can earn decent cash in this game mode. Each area’s training mode offers a different range, so shooting down targets can get tougher as you unlock more areas. Thankfully you can go back to the previous area and get some easy target practice to earn cold hard cash. The more targets you hit without missing any, the more cash you will earn. You can earn extra bucks for each head shot. Streaks will also earn you additional cash. A head shot will earn you 200 points but a body shot closer to the head will earn 150 points. When shooting down targets in the sniper training mode, do not zoom in too much. Targets appear and disappear quickly, and with a zoomed in scope, it will be difficult to track them down. Swipe down the zoom slider to a level so that the entire target area can comfortably fit inside your scope. I keep it at 6X or less. Adjust your scope according to the training mission’s range. But just don’t zoom in too much. When a target dummy appears, just point and shoot – don’t worry about head shots, you don’t have much time. There’s a ticking timer at the top-left corner of the screen and you need to put down as many targets as possible before the timer runs out. 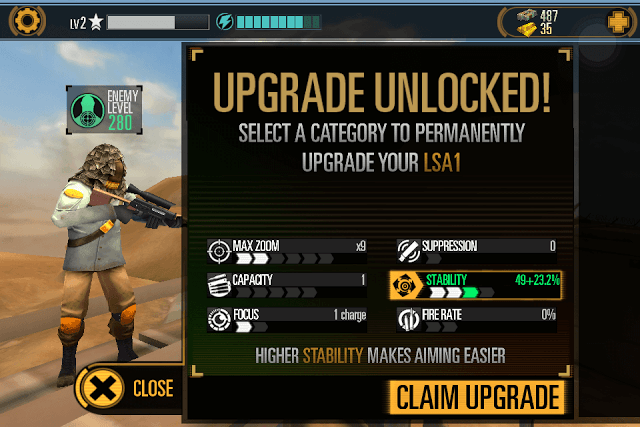 When upgrading your weapon’s level for “Red” Missions, don’t forget to select and upgrade your rifle’s capacity. Upgrading your rifle’s capacity will not only help you eliminate enemies in main missions, but also get more streaks in the training mode. Upgrading your rifles Capacity will allow you to shoot more targets before reloading. Too many precious seconds are wasted when the player reloads his weapon, and if it’s a training mode, then it’s definitely game over. With an increased capacity, you will be able to achieve more streaks and ultimately earn more cash. Zooming in to enemies will help you identify which targets are of low priority and which are high. Once you have identified a high priority target, use focus to get into slow mo mode. Tap on the shoot button to get a head shot. Focus can be immensely helpful to get head shot. You get extra bucks for each successful head shot. You will need 1600 bucks to get a basic assault rifle. Purchasing an assault rifle not only opens up new missions in every area, but also unlocks another training mission. You will receive more cash from assault rifle training missions. Later you can purchase a basic shotgun (costs 1000 bucks), which will unlock shotgun missions. Shot gun training missions also reward players more cash, but assault rifle “train and earn” missions give maximum cash. You will find explosives scattered everywhere in the mission scene. Look for moving trucks carrying explosives and hit them when they move closer to your targets. Enemies on patrol may also come close to an explosive barrel. Grab this opportunity and hit the barrel to eliminate multiple enemies at once. Explosives usually appear in missions that task players to take down several enemies.